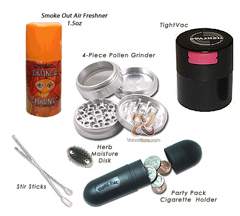 Get all your necessary vaporizing OR smoking needs accessories in our special DISCOUNT COMBO PACK! Included in this combo pack is everything needed to maximize both your vaporizing experience and its efficiency. You’ll get air-tight storage for home, handy storage for the road, and a replenishing moisture disk to keep your herbs fresh. You also get a deluxe grinder that saves your special pollen, stir tools to mix it up, and finally some Smoke Out Air Freshener to keep your surroundings smelling clean after you are done with any kind of session! At nearly 25% off retail prices, this accessory pack is a must buy for anyone looking to get the most out of vaporizing! * TightVac & Party Pac colors are selected at random. Everything I wanted in one package! It is like VaporStore.com read my mind! Thanks for putting this together and taking the thinking out of it for me!